If you love to drink tea, then you’re in luck. A variety of teas have been around for thousands of years, and many have thought that they have amazing health and healing benefits. While tea is not a cure-all for many health conditions, there have been many studies looking at the different types and how they actually affect the body. 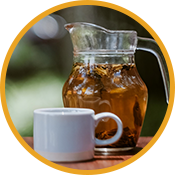 While research tends to be mixed concerning how much, what types, and to what extent tea can help you, there are still some generally agreed upon benefits. 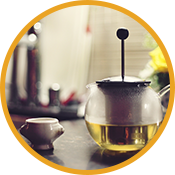 Before we jump into tips for healthy living that revolve around the many benefits, get to know the different types of tea that are available to try. 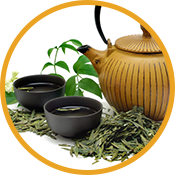 Green tea is most well-known for its health benefits. This popular Asian tea is made from steamed leaves. This process allows it to have both a light flavor and for the leaves to retain more of their health benefits. Black tea has the highest caffeine content of all the different types. While many types of tea are made from just one plant’s leaves, the Camellia sinensis plant, the different ways of processing the leaves and the other ingredients included makes them taste drastically different. Black tea is made from fermented leaves, and while it’s not as potent as green tea in terms of the health benefits, black tea still retains several helpful health benefits. White tea is made from dried leaves. The flavor is quite light and it is chock full of beneficial antioxidants, as it is uncured and unfermented, unlike most teas. 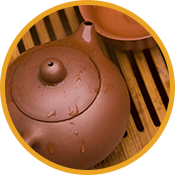 Oolong tea is highly processed, even when compared to both black and green teas. It goes through a process that bruises the leaves and then bakes them several times prior to reaching a final, packaged product. 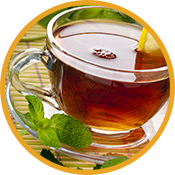 Herbal teas are not made with the same leaves as any of the above teas. In fact, another name for them could be fruit teas. These teas have no caffeine and are blended from a variety of dried fruits and herbs in order to make a mixture that can be brewed. 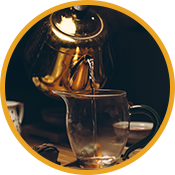 We include a miscellaneous category for types of tea because there are others that we didn’t mention here including rooibos, matcha, and Pu-erh, just to name a few delicious options. Coffee is the typical go-to morning drink because of the sheer amount of caffeine that is packed into coffee beans. However, leaves from the Camellia sinensis plant also carry some caffeine to help perk you up, but not nearly as much. 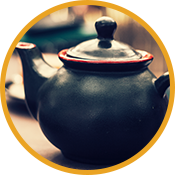 Black teas can have roughly 22 to 28 mg of caffeine per gram of dried leaves. Green teas have about half that amount, so it’s still enough to perk you up without giving you jitters. Maybe we shouldn’t say that they have just a small amount, as roughly 30 to 40 percent of a tea leaves’ composition is made of a variety of polyphenols. The consumption of polyphenols in high enough quantities may be able to treat high cholesterol and help to lower both total and LDL cholesterol counts. Are you trying to lose those few stubborn pounds around your midriff? You don’t have to worry about cutting back on the tea. As long as you aren’t someone who likes to add two sugar cubes or have a London fog, then your tea is going to be zero calories. 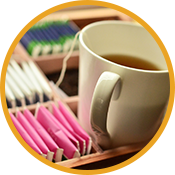 The problem only happens when you add milk or sweeteners to tea. Those add all the calories right back into your diet without you even realizing it. In addition to cutting calories, consuming plenty of tea can help you feel more full, which can help to nip snacking and splurging in the bud. This may seem counter intuitive, as most teas are caffeinated; however, it’s true! 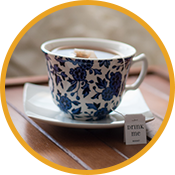 As long as you don’t add milk or sweeteners, even caffeinated tea can have a net hydrating effect on your body. This is the perfect reason to ditch the water bottle and keep a travel mug with you. Enjoy the benefits of water, but with additional flavor and nutrients. 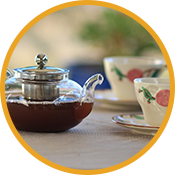 When you drink tea made from the Camellia sinensis plant, you’re also getting a beverage chock full of antioxidants. Cells in your body can be affected by free radicals. Free radicals can cause certain cells to oxidize, leading to cellular damage or death. Antioxidants help to remove free radicals from the body by providing an alternative for the free radical to bond with instead of allowing the free radicals to damage your body. Much like tea, CHOLESTSolve 24/7, by American BioSciences, contains high levels of polyphenols which the FDA believes may help to reduce the risk of heart disease if you include 800 mg or more a day into your diet. Tea may help with this, but to get enough, try CHOLESTSolve 24/7. Additionally, CHOLESTSolve 24/7 has other beneficial ingredients, including green tea extract. Shop online with The Harmony Company today!